Bouguets of praies are bestowed upon our Lord Jesus Christ, for as much as we have written about the chronicles of this end time prophecy of the three phases of the spiritual coming of Christ in 1 Thessalonians 4:16, which was fulfilled by the completion of Revelation, Chapter 10, that brought us into Ephesians 4:13-16, having been given the gift of the grace of God to proclaim this last trumpet message which has been put into our hands to show forth the golden pathway which we have followed into this precious rapturing faith, which is only for the wife of the Lamb. We are reading in the Word of God today some very familiar scripture that is in the Tenth Chapter of the Book of Revelation, and we are depending on the Lord to bless us and to give us the things that are needful as we walk with Him. So my thought is, The Chronicles of the Tenth Chapter of The Book of Revelation and the Eating of a Bitter Meal. In the day that we are living in we sometimes say, "We've got to take the bitter pill." And John speaks of eating the little book as being something that tastes like honey in the mouth but would cause a bitter belly. When we first begin to eat it, we realize that this food that tastes so good is really a bitter meal, and it will do its work within us causing the bitter belly, until by this Word we are translated out of the natural realm of our thinking into the spiritual Word that produces the spiritual man with a good feeling in our spiritual belly. So after eating it, we developed a spiritual system that understands why it was needful for us to eat this food that caused the bitter belly. This bitter meal keeps all but the elected from the table, for it is necessary to have a revelation in order to eat something that causes this uncomfortable feeling. But we realized that this was a new beginning for us in our final act of presenting our body unto our Husband (Romans 12:12), making us bone of His bone and flesh of His flesh in marriage which produces glorification of our physical body. Even in the Old Testament at the time of a new beginning, they ate some bitter herbs. (Exodus 12:2-8) But it's the chronicles of the Tenth Chapter of the Book of Revelation that we are dealing with now. This Tenth Chapter is something that has happened in our day that we have been dealing with for some time now. And we will continue to deal with it as an important chapter until the rapture, as we praise our Savior for what He has done for us in showing us the fulfillment of this chapter and the marriage of the Lamb. This means that this chapter has been fulfilled. Prior to this time, it was a prophecy and we were waiting for its fulfillment; and now we have lived to see it. Now there is a difference between a prophecy and the chronicles of something. We know that prophecy is something that is spoken that will happen in the future. And chronicles are what we read while something is happening or after it happens; and basically that is what chronicles means in our message today. Within the Bible are two books by God's choosing that are entitled, 1 Chronicles and 2 Chronicles, which are records of what happened in Israel. So if you want to know what has happened back through time to Israel, the battles they fought, about the kings and their wives and children, and many other things about them, it has been written. And to Israel that is important! Actually, much of the Old Testament consists of a combination of prophecy and the chronicles of time from the Book of Genesis up until the coming of our Lord Jesus Christ to start the New Covenant. And now for the wife of the Lamb, we have a chapter in the Book of Revelation that has become the chronicles of the spiritual coming of Christ. This has occurred in our day and it was fulfilled in three phases (or parts). This is seen in 1 Thessalonians 4:16, and also in Ephesians 4:13-16, giving us a further explanation of this same event that has taken us into the fulfillment of it, which shows our perfect marriage that was made in the heavenly realm, even though we are still in the earth. 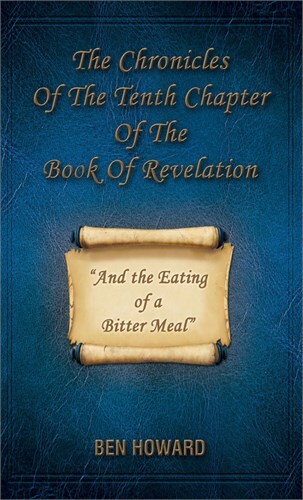 Please read the entire book below for the full revelation of Chapter 10 of the Book of Revelation.